Only about an hour outside of Santa Fe, NM is a landscape of wide-open vistas, tall cliffs, table-topped mesas, massive cottonwood trees bordering the Rio Chama, and far off mountains in the distance. Beautiful scenery exists around every bend of the winding roads. The region is as colorful as its history, with the surrounding Piedra Lumbre's yellow and red cliffs. Ghost Ranch provides an array of different adventures and programs to help visitors discover the beautiful landscape and learn more about New Mexico's history. Ghost Ranch is open throughout the year and is committed to honoring the environment, spiritual development, justice and peace, and exploring family through celebrating nature, culture, and art. The area's twenty-one thousand acres of vast skies, vivid colors, and towering rock walls were made famous by the well-known painter Georgia O'Keeffe. Visitors are drawn from across the globe to paint, ride horseback, write poetry, to hike, to research fossils, or just to rest their spirits. There are a number of opportunities for outdoor adventure just waiting to be had at Ghost Ranch. From hiking to lakefront fun to overcoming fears on the high ropes, there are fun adventures for everyone. Ghost Ranch features three different hiking trails that take hikers past dinosaur fossil quarries, through green forests, past red rock formations, and over hills. High desert hiking is a truly unique experience that offers breathtaking views along the way. Visitors of Ghost Ranch can take advantage of a variety of tours to learn more about the area and its history. The O'Keeffe Landscape Tour explores the stunning landscape by motorbus. Guests can see with their own eyes the actual locations and scenes throughout Ghost Ranch that served as the inspiration behind the paintings of Georgia O'Keeffe, along with stories of the many years she spent in the area. 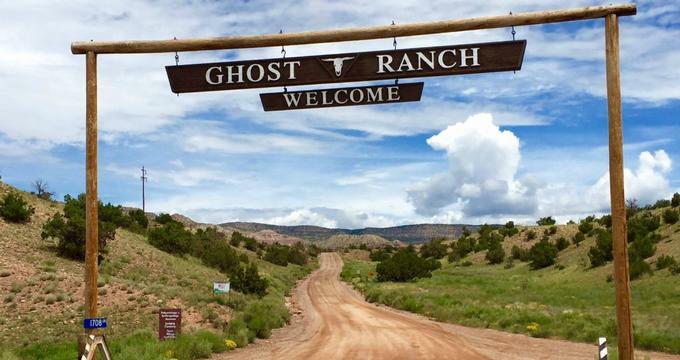 For film buffs, the Movie Tour is an excellent way to enjoy a visit to Ghost Ranch. Many movies were filmed on location at Ghost Ranch, such as Indiana Jones and the Crystal Skull, Cowboys and Aliens, The Missing, Silverado, Georgia O'Keeffe, 3:10 to Yuma, City Slickers, and Comanche Moon. The Movie Tour lasts around two hours, and include a walk of one mile over an uneven surface. Visitors can also choose to take a trail ride at Ghost Ranch. The O'Keeffe Landscape Trail Ride. Riders of any skill level are welcome to join the ride, which occurs every day at ten in the morning and two in the afternoon. Participants will journey out to the locations where Georgia O'Keeffe was inspired by the landscape to complete many painting and own a home. The trail ride starts with an introduction into Georgia O'Keeffe's work along with a preview of samples of some of her artwork. Then the ride takes to the trails into a restricted part of Ghost Ranch where guests will be able to view the actual settings of O'Keeffe's paintings. Piedra Lumbre's yellow and red cliffs, black trails of waterfalls against walls of canyons, and Pedernal Mountain are all combined with stories of O'Keeffe's fifty years at Ghost Ranch.